The single most important thing protecting your home from wind, weather, and water is the roof. Whether you’re looking to replace the roof on an existing home or pondering options for a custom build, knowing your material options is a huge help in planning and budgeting for the job. AROCON Roofing & Construction is here to help guide you in choosing the perfect shingles for your home…so, let’s consider some options! Most people, when they think of roofing, think of the asphalt shingle. Affordable, durable, reliable, and very replaceable, the asphalt shingle is a standard for very good reasons! But before we travel further down the yellow brick road, let’s divide asphalt shingles into two general categories: fiberglass and organic. Fiberglass shingles, as their name implies, are made of a woven fiberglass base that is covered with an asphalt coating to make them waterproof. The asphalt coating is then topped with ceramic granules that provide both UV protection and color. Fiberglass shingles tend to be lighter in weight than their organic counterparts, since less asphalt is needed in the manufacturing process and that fiberglass mat provides a lot of strength and durability. 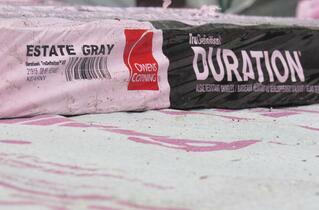 Fiberglass shingles also tend to have a higher fire-proof rating and longer warranty than organic shingles. In the three decades since they were introduced to the market, fiberglass shingles have become the go-to choice for most contractors. Organic shingles are made from a mat of recycled felt paper which is saturated with asphalt for waterproofing, then coated with an additional layer of asphalt and ceramic granules. Because organic shingles use more asphalt in their manufacturing process, they are thicker, heavier, and more expensive than fiberglass. Organic shingles are definitely rugged and flexible, but they are not a “green” option and tend to absorb more water than their fiberglass cousins. Both fiberglass and organic asphalt shingles come in a standard size (12” x 36”) and are available in two different types: three tab and architectural. Three-Tab Shingles have cutouts—called tabs—along their long lower edge. 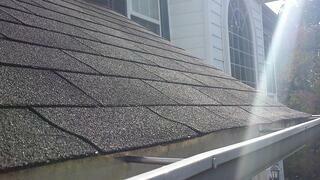 When installed, each shingle looks like three individual shingles due to the overlapping of the tabbed edges. Three-tab shingles are a good choice for longevity—15 to 20 years on average—but don’t offer much by way of “designer” look and feel. If you’re looking for a basic roofing material, three-tab asphalt shingles are the way to go. 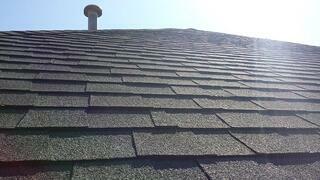 Architectural Shingles on the other hand, are a higher-end version of the fiberglass asphalt shingle. They don’t have a tab, which allows them to have a more contoured look. Architectural shingles come in a variety of colors and can create stunning effects—like slate or shake—at a fraction of the cost. Rugged and durable, architectural shingles last a bit longer than their three tab counterparts—at 25 to 30 years. 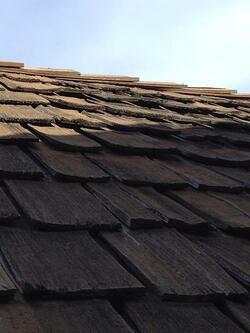 In the colonial era of America, it was not uncommon to see wooden shingles on houses. These shingles, known as cedar shakes, were traditionally split from a single piece of straight-grained wood called a “bolt.” Modern cedar shake shingles are cut from larger pieces of wood and can be offered in a variety of other wood types and colors. Additionally, there are rubber shake shingles that are made from recycled tires that resist the rot and curl of traditional wood. Wooden shingles are made of red cedar which is incredibly durable, and can last up to 50 years if properly installed and maintained. Shake is a great idea if you’re looking to preserve the historical look of an older home, but it does present a greater risk in terms of fire, and the cost can be prohibitive. There are few things more impressive than a slate roof. Durable, fireproof, and stately, slate has a beautiful look and a lot to recommend it. 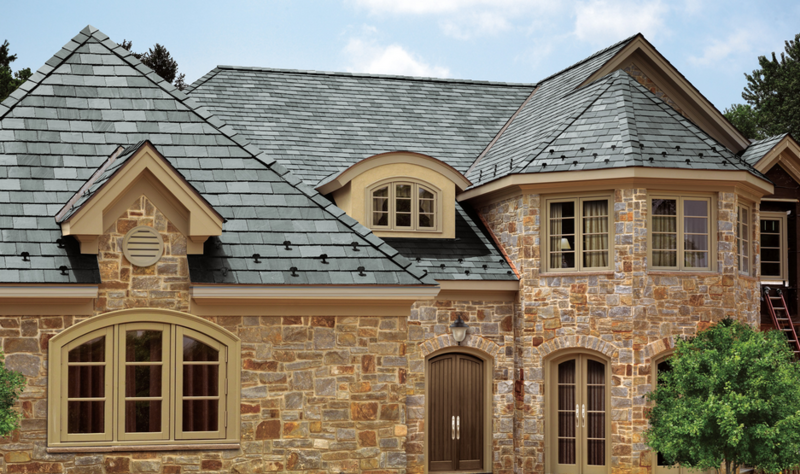 Slate is a natural material, which makes it one of the more environmentally friendly options for roofing, but it’s also extremely heavy and quite expensive. If you have the budget available and are considering a slate roof for your home, be sure to have a structural engineer inspect your home to ensure the roof truss can support the extra weight. Because slate weighs as much as 1,500 pounds per square foot, you’ll want to have every assurance from a qualified professional that your roof can handle the material. Also make sure that your roofing contractor has experience and knowledge with slate roofs, which require a higher degree of skill and knowledge than asphalt shingle to install. The last thing you want is an expensive, and poorly installed, roof on your home! Take a drive through the country and you’ll probably see a few old farmhouses with metal “standing seam” roofs on them. And, if those roofs have been properly maintained, chances are they’re more than 30 years old. 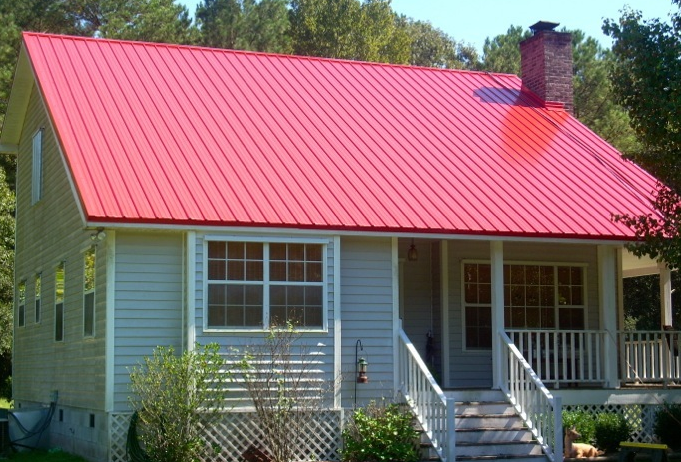 Metal roofing is available in a variety of types, with galvanized metal being the most popular type at present. These roofs are highly durable, with a lifespan of up to 50 years, and are relatively easy to maintain. A semi-annual coat of paint is pretty much all that is needed to keep them watertight and looking nice. Metal is a great choice for both steep pitched and flat roofs. In the end, no matter what material you choose for your roof, it’s good to know that you have plenty of options and that, no matter your budget, you’re sure to find a good fit and a nice look for your home. Remember, there’s no place like home!